We really enjoyed driving the spacious 2015 Toyota Sienna XLE, which was perfect for our 14 hour road trip from Toronto to New Brunswick. Everyone in the family felt that they had comfortable amount of space to stretch, and to be seated during our travels. The ride was smooth throughout our trip despite the variety of road conditions we went on. In my upcoming posts, you will see that we not only drove the Sienna in the city, but also in small towns, winding highways, rugged roads, and lots of drivable trails. Since our trip to Prince Edward Island a few years ago, my family and I have been drawn to Atlantic Canada. Going on the road trip along the Fundy Coastal Drive in New Brunswick was lots of fun for everyone in the family. I like that going on road trips give us a different perspective of how the landscape changes, and it is a wonderful way to teach children about different provinces in Canada. We had lots of cargo, since we went for a week, and I was happy how neatly we were able to fit all our belonging in the deep and spacious cargo in the back and still have the 3 seats in the back available. There is ample to keep drinks all over the vehicle, perfect for road trips. The smart key system with the keyless push button to start the vehicle was convenient. We can keep the key in our pocket, and this way we didn't have to look for the key everytime we got on and off the vehicle to visit attractions and expeditions such as checking out over twenty observation points at the Fundy Trail Parkway. The adjustable seats are fabulous as we can customize to our preference. The Driver Seat Memory System is fabulous, as the driver seat can be customized and the positions can be saved to memory. This is convenient, as drivers take turn the Sienna remembers the seat position and the mirror settings, so we don’t have to adjust the settings again. The 7" display screen by the driver and the front passenger can be split into three or two parts so we can see the audio that is playing, the route map, and other built in apps. The driver easy speak was convenient so we didn’t have to speak loudly from the front to the passengers sitting in the back. We liked how the overhead console box with sunglass storage, also had a conversation mirror that allowed the passengers to see each other. It was awesome how the system recognized the time change right at the time zone and changed it. One of our favourite features was the blind spot monitor system sensor that lights up on the side view mirrors, and the backup sonar that lights up and sounds a buzzer when it detects obstacles. The wide angle back-up camera is very convenient as well. The controls are easy to operate, and we can also use voice command, as well as synchronize our phone via Bluetooth so we can concentrate on driving. The GPS has all the standard features, and allows us to check the points of interest quickly for our convenience. This also has a safety feature, and does not allow to check all of the POIs until the vehicle is stopped. It was neat how the windshield detected rain and automatically operated, and adjusted the speed accordingly, this rain-sensing front wipers work when it is set to AUTO. The headlamps automatically switched between high and low depending on the traffic, and visibility. For example, when we went through underground bridges, the interior lights and headlamps came on automatically. My children loved the captain seats. I like that we can easily slide the captain seats close to the front seats or push it back. There is lots of legroom, and lounge seating is comfortable to place the legs up. We can slide the centre console that holds the rear seat cup holders between the first and second rows. 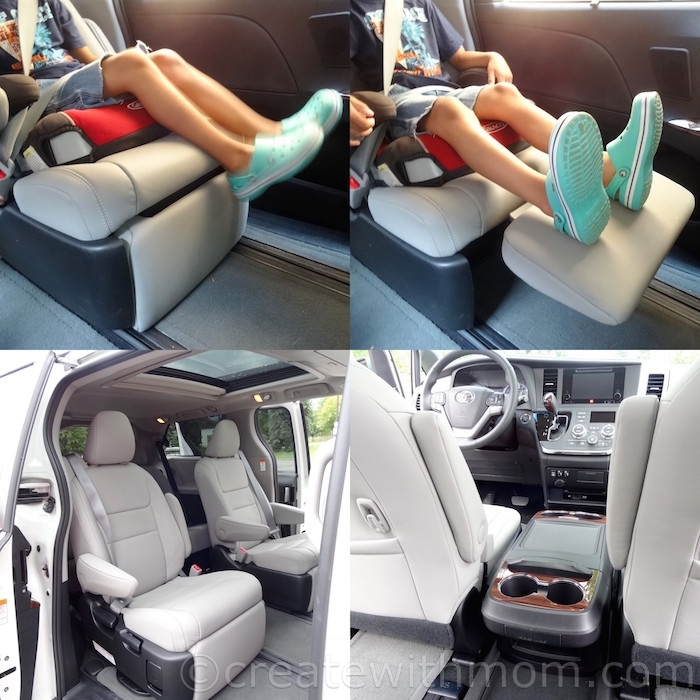 This seven-seat passenger vehicle is designed with lots of safety features such as doors with sensors so we can avoid accidents with the little ones as they come on and off the vehicle. There are lots of parental controls for safety reasons in case you didn’t want the children to operate the doors, the moonroof, windows, temperature etc. The only thing that we thought is missing, and should be placed is when the gas tank is open the rear sliding doors should have a sensor to not open. We liked the multi-panel moonroof. Having the divided front and rear passenger tilt-and-slide moonroof instead of one full moonroof is wonderful, so we can either open or leave it closed as we wish. The passenger windows have screens that we can pull up to block the sun. We really liked the three-zone temperature control feature of being able to keep it in sync or customize according to preference for the driver, front passenger, and for those sitting in the rear of the vehicle. The heated front seats and leather wrapped steering wheel are perfect for cool mornings and winter. We loved the extra options of audio such as being able to hook up our USB flash drive and play from our mobile phone via Bluetooth on top of the AM, FX, XM radio channels. Having the extra wide 16.4” dual-view rear seat Bluray entertainment system is useful during long road trips. We can also play video games hooked to this monitor. The screen can be split into two screens, so the passengers can either watch or play according to their own preference. I like that we can control the sounds, and wear the wireless headphones that comes with the vehicle when watching the shows or movies on either the DVD or Bluray, so all the passengers don't have to hear the show if they are not watching it; this way the driver can easily concentrate as well. It is easy to change the controls from the front so the audio system is more clearer in the back, and those in the back can hear better and not distract the driver and the front passenger if they preferred to have a conversation than listen to the show. The seats in the last row has space to plug the headphones or listen to audio through the connected USB. 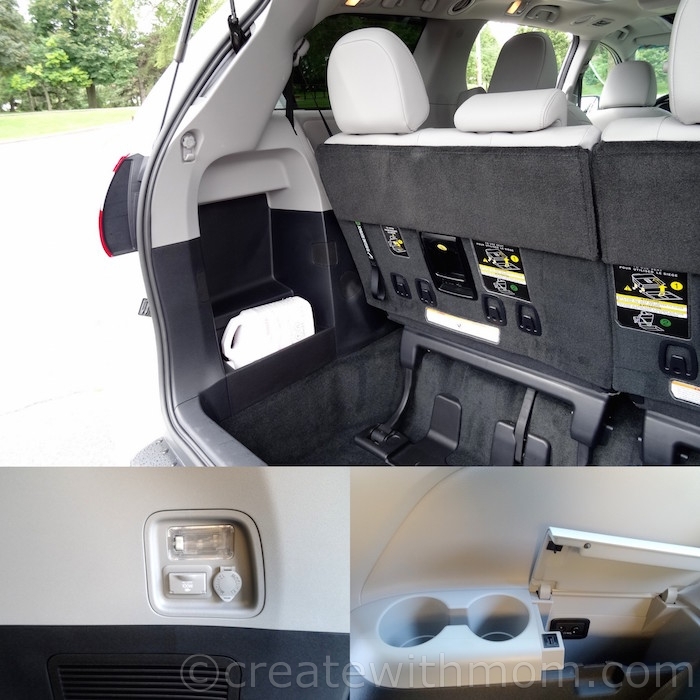 Among many of the neat features such as shopping bag hooks, driver's coin case compartment, there is also a 120V Accessory Power Outlet in the cargo area. 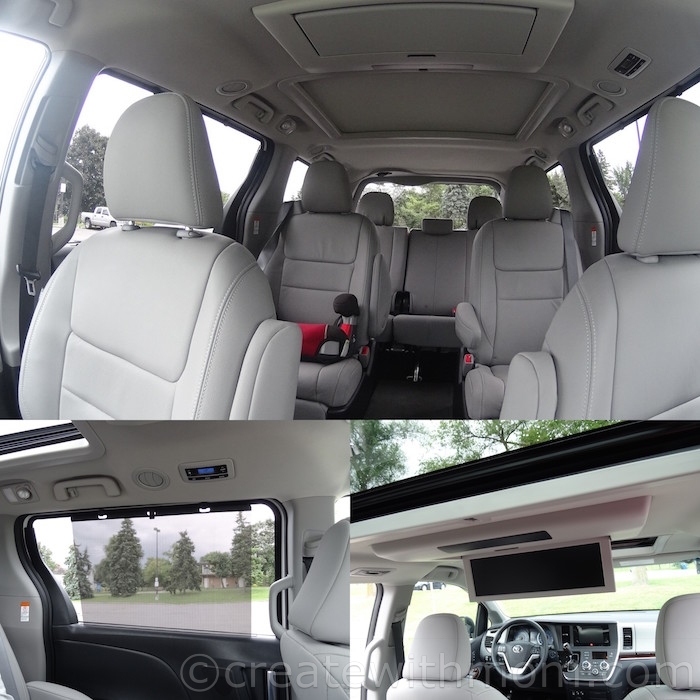 This V6 engine Toyota Sienna is beautifully designed in the interior as well as the exterior of the vehicle. The low weight, low noise, and low vibration deliver power without sacrificing fuel efficiency and low emissions rating 12.5L/100km. I love the standard size of the van from the outside, with all the well-thought out features in the inside. 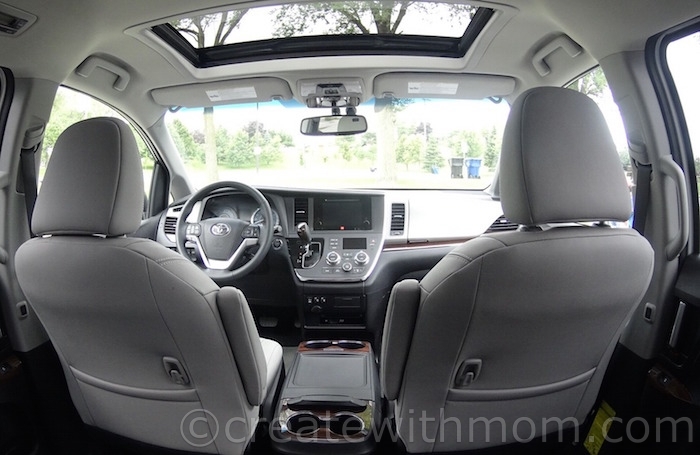 Overall, we think this is a wonderful family vehicle because of its fabulous features and space. From the outside, it doesn't look like this vehicle has as much room as it does! I love those captain seats. My son would enjoy being able to put his feet up during road trips. Great looking 7 seater. It is nice to have a new ride. How was it on gas? That is one beautiful and spacious vehicle! Great looking vehicle with lots of room. We did a road trip from Brandon, MB to New Brunswick and I loved every minute of it - we had a nice spacious vehicle too which does make it all so much easier on everyone.